It’s little more than a cluster of mud, moss, and twigs, but to me, it is cause for joy, and not a little excitement. This year’s Phoebe outside my office window. 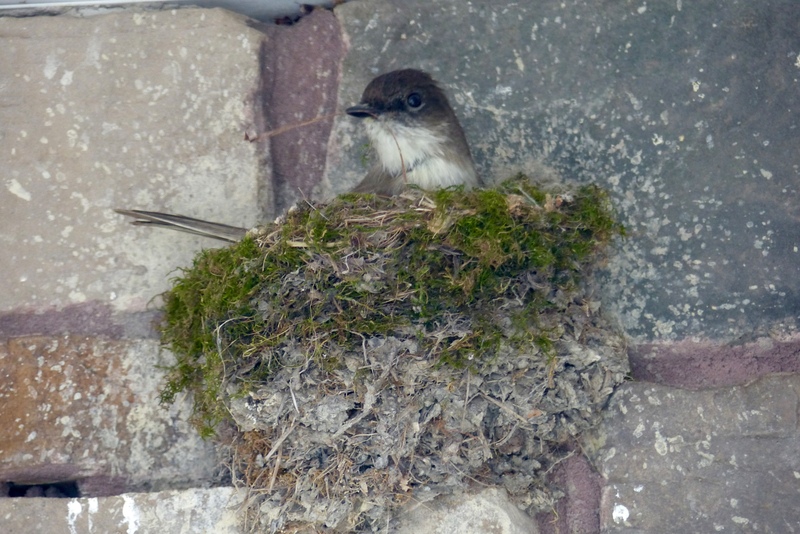 An Eastern Phoebe nest has been affixed to the stone on the front of our house under a soffit for several years now, serving as a marker of spring when it is visited by the brown-and-white flycatchers and refurbished for a new brood. This year, the first Phoebe arrived the week before last and since has been insistently calling “FEE-bee! FEE-bee!” in the morning, afternoon, and evening, sometimes stopping outside my office window to bob his tail and announce his presence. One morning last week, another flash of brown revealed he has a mate and that she is shoring up the remains of the old nest. We can already see the evidence of this in the fresh mud, moss, and bits of vine she has applied as she ferries material from the pond and the garden to the nest. Our hope, of course, is that these industrious little birds who have worked their way into our hearts will succeed in raising a family like those we have seen in past years — though not the last two. The year before last, we suspect that a predator bird ravaged the nest and sent the Phoebes fleeing. Later, they began building new nests in two alternate locations, finishing one that still sits atop a post on our wood-storage unit, but despite some nest-sitting, no little Phoebes ever emerged from it. Last year, the Phoebes again abandoned the nest on the house, this time early in the breeding season after a Brown-headed Cowbird had been seen nearby. Cowbirds lay their eggs in other birds’ nests and leave them to raise their young to the detriment of the host bird’s own offspring. Although we saw the Phoebes occasionally later in the season, there was no sign that they had established another home nearby. Time to fledge. Phoebe chicks getting too big for the nest in June, 2012. After several consecutive years of watching these delightful birds raise their families, we had almost come to expect that we would spend our summer evenings on the front porch watching the adults swoop down in the garden to catch insects and fly them back to the waiting mouths of their chicks. While working outside and passing by the site, we also had become accustomed to the sight of little heads popping up and their bodies growing to the point that they were practically spilling out of the nest as the day of departure approached. One year, after the chicks fledged, and thanks to my husband’s keen eye, we even were able to spy the entire family in the woods through our binoculars and spotting scope. In her enchanting book, Letters from Eden, Julie Zickefoose, who is so fond of this bird that she named her daughter Phoebe, writes that to her, the Phoebe “embodies bird spirit” in its constant motion and charm. I heartily concur and would add that underneath the Phoebe’s unadorned appearance seems to beat the heart of an indefatigable warrior with perseverance in its veins. For that, we love these birds in the same way we love people who have little in the way of looks or sparkle to offer the world, but whose virtue most likely is keeping everything around us intact. In this, they remind us of faith that is unseen yet is the assurance of things hoped for. So it is that each spring, the Phoebe beckons us to believe in possibilities and to watch for their fulfillment. The best of the birds: A post about spring birds is a great opportunity to include a plug for the Biggest Week in American Birding, which takes place May 8-17 in northwest Ohio. If you can get to this area, known as the “warbler capital of the world,” next month, you will not only see some amazing birds showing off their spring colors, but you will meet some wonderful people. 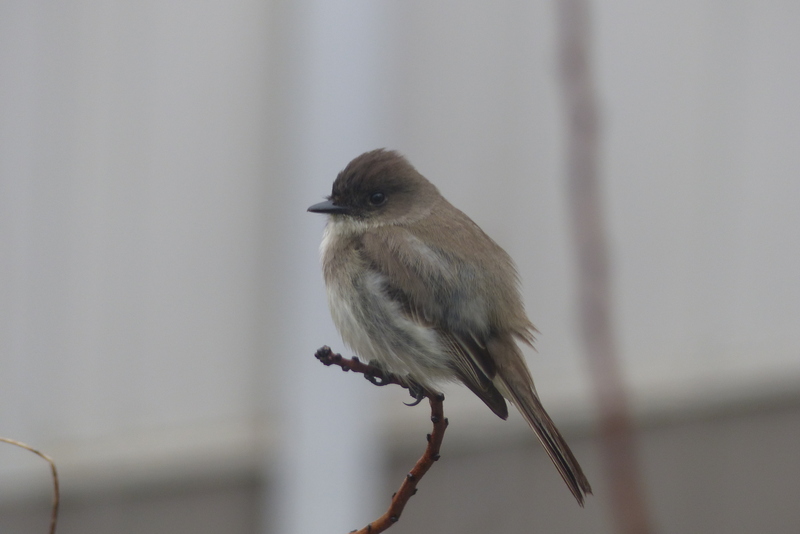 This entry was posted in contemplative living and tagged Eastern Phoebe, flycatchers., Julie Zickefoose, Letters from Eden, nesting, parasite birds, Phoebe, predator birds, spring migrants. Bookmark the permalink. I love how these delightful little phoebes have captured your hearts! They are very fortunate to have found your home for their home! I hope you savor every moment of the birding season this year! Thank you! I am definitely savoring their presence! Very enjoyable, Judy. Love reading your articles. Thank you, Pearl! And I love that you are such a faithful reader! Beautifully written with an important message. Thank you..
What a lovely comment, Bev. Thanks for your good words! Loved this, Judy! Here’s hoping for a successful chick rearing season! Thanks, Cindy! It’s spring and hope is in the air! A picture of “If at first you don’t succeed, try, try again.” A memorable saying of my mother! Memories!!! So nice to think of your mom in relation to the Phoebes, Diane! Her saying certainly fits their determination and persistence! Wonderful post. Years ago, John Stott wrote a book called “The Birds our Teachers”. Your post reminds me of this! I think I’d like to read Stott’s book! Thanks for mentioning it and for your comment, Bob. Thanks for a lovely post Judy. You are so welcome — and thank you for reading and for commenting! Thanks, Kim! Knowing how busy you are these days, I appreciate your reading and commenting!